← ANOTHER GREAT HOT DOG! 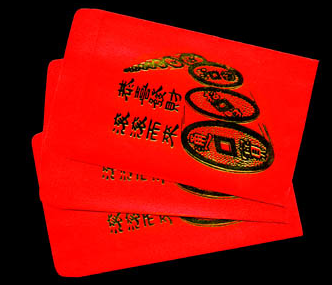 Traditional "red pocket" envelopes for giving money are good feng shui. RED CANDLES The color red activates and stimulates. Red candles are available in abundance during the holiday season and can be found at Target or even Trader Joe’s at prices that won’t break your bank. Or try thefind.com online.Accompany a large red candle with a beautiful candle holder and a hand written note advising your recipient to light it in their Wealth, Fame, or Relationship areas of their bagua for good feng shui results. Those areas can be found at the upper left, middle, and right hand sides of any space you’re facing toward. Double Happiness candles from Red Envelope. INCENSE Readily available at retailers everywhere, you might find a more sophisticated selection at yoga center gift shops. Look for classic scents such as jasmine, ginger, green tea, and patchouli. This gift will lift your hipness quotient quite a bit, too. MOBILES Lightweight paper mobiles can be found in museum gift shops. A butterfly mobile is a good example that works for kids and grownups rooms. In Chinatown, one can find cocktail parasol mobiles at just about any shop. Mobiles function as art and as feng shui tools to add movement, stimulating good chi and opportunity, and creativity. Here’s one artist’s work. MONEY Wherever it’s appropriate, money is a definite chi booster. If it’s placed in a Red Pocket (a Chinese feng shui red envelope that you can find at any shop in Chinatown), it doubles the good fortune of both giver and receiver. The bright red envelopes with golden characters and artwork embossed on them make receiving that end-of-year bonus all the more fun.